In cold climates of North America, dahlias are known as tuberous-rooted tender perennials, grown from small brown biennial tubers planted in the spring. These colorful spiky flowers generally bloom from midsummer to first frost, when many other plants are past their best. They range in color and even size, from the giant 10-inch "dinnerplate" blooms to the 2-inch lollipop-style pompons. Most varieties grow 4 to 5 feet tall. Though not well suited to extremely hot and humid climates, such as much of Texas and Florida, dahlias brighten up any sunny garden with a growing season that's at least 120 days long. Dahlias thrive in the cool, moist climates of the Pacific Coast, where blooms may be an inch larger and deeper. Select a planting site with full sun. Dahlias grow more blooms with 6 to 8 hours of direct sunlight. They love the morning sunlight best. Choose a location with a bit of protection from the wind. Dahlias thrive in rich, well-drained soil. PH level of your soil should be 6.5-7.0, slightly acidic.If you have a heavier soil, add in sand, peat moss or bagged steer manure to lighten and loosen the soil texture for better drainage. Bedding dahlias can be planted 9 to 12 inches apart. The smaller flowering types, which are usually about three feet tall, should be spaced two feet apart. The taller, larger-flowered dahlias should be spaced three feet apart. The planting hole should be slightly larger than the root ball of the plant and incorporate some compost or sphagnum peat moss into the soil. It also helps to mix a handful of bonemeal into the planting hole. Otherwise, do not fertilize at planting. Avoid dahlia tubers that appear wrinkled or rotten. A little bit of green growth is a good sign. Don't break or cut individual dahlia tubers as you would potatoes. Plant them whole, with the growing points, or "eyes," facing up, about 6 to 8 inches deep. The crowns should be just above soil level. Tall, large-flowered cultivars will require support. Place stakes (five to six feet tall) around plants at planting time and tie stems to them as the plants grow. Large dahlias and those grown solely for cut flowers are best grown in a dedicated plot in rows on their own, free from competition from other plants. Dahlias of medium to low height mix well with other summer flowers. If you only have a vegetable garden, it's the perfect place to put a row of dahlias for cutting (and something to look at while you're weeding!). Dahlias start blooming about 8 weeks after planting, starting in mid-July. Some gardeners start tubers indoors a month ahead to get a jump on the season. Do not water the tubers right after planting; this encourages rot. Wait until the sprouts have appeared above the soil to water. 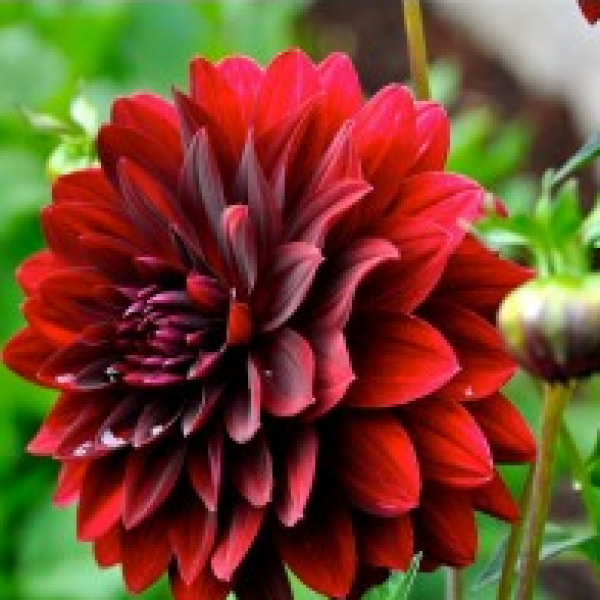 Do not cover the dahlias with mulch or bark or sprouting is more challenging; apply slug and snail bait to avoid pests. There's no need to water the soil until the dahlia plants appear; in fact, overwatering can cause tubers to rot. After dahlias are established, provide a deep watering 2 to 3 times a week for at least 30 minutes with a sprinkler (and more in dry, hot climates). Dahlias benefit from a low-nitrogen liquid fertilizer (similar to what you would use for vegetables) such as a 5-10-10 or 10-20-20. Fertilize after sprouting and then every 3 to 4 weeks from mid-summer until early Autumn. Do NOT overfertilize, especially with nitrogen, or you risk small/no bloms, weak tubers, or rot. Like many large-flower hybrid plants, the big dahlias may need extra attention before or after rain, when open blooms tend to fill up with water or take a beating from the wind. Bedding dahlias need no staking or disbudding; simply pinch out the growing point to encourage bushiness, and deadhead as the flowers fade. Pinch the center shoot just above the third set of leaves. For the taller dahlias, insert stakes at planting time. Moderately pinch, disbranch, and disbud, and deadhead to produce a showy display for 3 months or more. Dahlia foliage blackens with the first frost.